Designed in our Australian studios, the Pheobe Bridesmaid Dress is a dreamy, feminine dress that will captivate with its beauty. Featuring a slim fit in the bodice, the silhouette is finished with a relaxed flared hem and a skirt fabricated of polyester georgette. Capped sleeves trimmed with scalloped lace complement the sheer lace bodice and sweetheart neckline. The Phoebe style has an open keyhole back, and is available in 20 other lustrous hues. 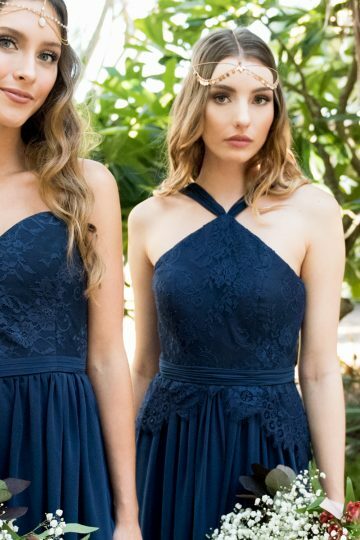 The Pheobe style is the perfect timeless piece for your bridesmaids, or for everyday evening wear, styled with a bold dark lip, or with loose, tousled waves and strappy heels. Due to its subtle and refined beauty, this Bridesmaid Dress is an ideal style for large wedding parties. With 20 colours available, match your bridesmaids, or mix-match for the perfect bridal styling. The gown’s cut and design is flattering to a variety of shapes and sizes (4-30). To identify your size see your nearest Tania Olsen Designs stockist and they will correctly measure you and assist with selecting your size.